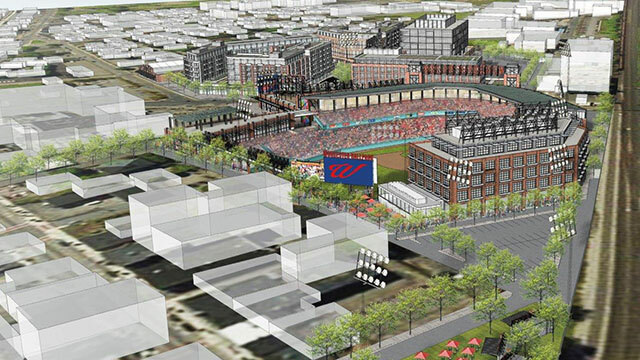 The ballpark rendering above shows an aerial view of Worcester's canal district. The ballpark itself has not been designed yet. The Pawtucket Red Sox today signed a Letter of Intent to build an innovative downtown ballpark in Worcester, Massachusetts that would be scheduled to open in 2021. PawSox Chairman Larry Lucchino today signed the letter in a ceremony at Worcester's City Hall with Lieutenant Governor Karyn Polito, Mayor Joseph Petty, and City Manager Ed Augustus. The project is subject to the approval of the Worcester City Council, the International League, and the National Association of Professional Baseball Leagues ("Minor League Baseball"). "We are eager to build an innovative, family-friendly ballpark that reflects the love and appreciation of baseball and that unifies Central Massachusetts and the Blackstone Valley Corridor," Lucchino said. The design and construction of the ballpark would be overseen by Lucchino and Janet Marie Smith, who partnered to create Oriole Park at Camden Yards in 1992 and who together oversaw a decade of improvements to Fenway Park, starting in 2002. Lucchino also spearheaded the effort to create and design Petco Park in San Diego and JetBlue Park in Lee County, Florida. Smith is currently Senior Vice President of Planning and Development for the Los Angeles Dodgers. She will continue in that capacity, overseeing improvements to Dodger Stadium, while participating in the design of the ballpark in New England. "This day marks a major milestone on a journey that began 12 months ago," said Pawtucket Red Sox Chairman Larry Lucchino. "Through the entire process, the spirit of collaboration and cooperation between the City of Worcester and the Commonwealth of Massachusetts has been inspiring. "The contagious enthusiasm of the leaders of the business community, and of everyday citizens, has been warm and welcoming, starting of course with the now-famous 10,000 postcards we received from all over Central Massachusetts, organized by the Canal District Alliance. "We have noted how proud people are of this city, how committed they are to its continued resurgence, and how excited they are to inscribe a new chapter in its long and rich baseball history. "We look forward to designing and building an innovative downtown ballpark with year-round uses that further enlivens the city, enhances its civic self-esteem, and adds to its beauty. We are eager to create a wonderful point of pride for children and students and families throughout Central Massachusetts." The PawSox will continue to play at 77-year-old McCoy Stadium the next two years. Pawtucket and Worcester are part of one market as defined by Minor League Baseball. "I thank the Mayor of Pawtucket, Don Grebien, who is a wonderful partner, an honorable public servant, and an heroic champion of his city." Lucchino said. "We continue to wish him well and will remain supportive of his efforts to improve his city. We also thank the fans of our region, who have loyally supported this baseball club for decades." "I also thank the City Manager of Worcester, Ed Augustus, who worked relentlessly while leading a process that contained few bumps or bruises, few delays or abrasions. He and his talented team-and the entire community-have led us to this point. "I would also like to express our gratitude to Worcester Mayor Joe Petty and the 11 City Council members for their encouragement, support, and public service. "We are also here because of the leadership of Governor Charlie Baker and, especially, the tireless can-do attitude of Lieutenant Governor Karyn Polito. Good things happen when we all work together. "We look forward to celebrating with everyone in the Heart of the Commonwealth…and the Heart of New England."